Soccer as we know it has undergone several modifications since its earliest stages. Back in 1529, a soccer-esque sport called ‘Calcio Fiorentino’ was being played between two teams with 27 players each in the Piazza Santa Croce, a famous plaza in front of a basilica in Florence, Italy. The players used this game to solve their political differences in a match full of violence and intensity. These differences were normal back in 16th century Italy, when competition was more a matter of showing superiority and dominance over a rival group—as in matches between aristocratic families and gangs that dominated different parts of the city-states—than playing for fun. Some scholars have reported tentative tactics used during these matches, in which 15 players were attackers and five were midfielders. If we look back to 1950s soccer distributions, such as the ones with four attackers and two midfielders (4-2-4), the formation in Calcio was not all that different from soccer. The key point, however, is that in Calcio this was not always true and followed strictly. Almost every player was both an attacker and a defender depending on the situation. As the tactics were still being formed, the teams were not used to following them and would instead focus solely on the main objective, which was to run towards the goal to score or to prevent the other team from doing so. Tactics such as setting up a counter attack were not as important as chaos. It’s telling that all players were allowed to use their hands and feet to carry the ball. Calcio, then, was more a sloppy blend of soccer and rugby rather than something closer to either one of these two sports as we know them individually. The first set of rules that started to change this scenario were the Cambridge Rules, in 1848, which still kept the sport positioned closer to rugby, with rules such as “No player is allowed to loiter between the ball and the adversaries’ goal,” but also prevented players from holding the ball or from pushing and tripping their adversaries. This distinction was even clearer with a code created in 1858 by the English team Sheffield Football Club, which stated, among other rules, that players could no longer hold the ball with their hands, although they could still use them to hit it—Cambridge still allowed players to hold the ball and kick it, without running, if it was caught with their hands directly from their foot. The system of having 11 players on each side, the statutory number in current soccer, was first used by Sheffield in 1863, but it was widely adopted by other teams by 1867. Some of these, though, still thought it was fair game to keep using 14 players. Tactics on the pitch started to gain importance when the first goalkeeper appeared in 1871. The matches looked more organized with only 11 players on the field, although the oldest video recording of a soccer match, between Blackburn Rovers and West Bromwich Albion, shows that, although some players should were meant to stick in midfield, they still focused a lot on scoring regardless of their tactics. Today’s World Cups were the main catalyst for tactical evolution in club football. By 1925, defense had become a priority through the formation commonly known as ‘WM’, with three defensemen, three attackers, and four midfielders; all forming a W and M on the field. Midfield control and ball possession were essential in Brazil’s 1970 team. And the Netherlands’s renowned ‘Clockwork Orange’ (a nickname for the national soccer team) in 1974 used a defensive strategy in which more than one player would quickly swarm an opponent to steal the ball. It looked like the Netherlands was always about to run over a player. A bizarre tactic to watch but one that turned out effective. From 1986 until now, almost every World Cup champion focused on having a strong midfield presence with at least four players in the position, from Argentina in 1986 to Germany in 2014. In the first case, due to the limitations the 1986 Mexico World Cup brought to most teams—such as playing in altitudes and temperatures higher than usual, and under an overbearing sun at noon—they pulled back one attacker to the midfield and played with three attackers and five midfielders. This change was then adopted by other teams because it allowed them to split these five players in offensive and defensive positions on the midfield itself. I won’t detail the other strategy because the 7-1 German win against Brazil in the 2014 World Cup, held here in Brazil, still makes me cry every night. We Brazilians even created the expression “Each day is another 7-1” when talking about disappointing facts off the back of it. Rocket League‘s (2015) history is not as long as that of the sport’s that inspired it—and, fortunately, 7-1 is not a highly unusual score. The ‘soccer with cars’ game was released in July last year and if we consider its PlayStation 3 predecessor Super Acrobatic Rocket-Powered Battle-Cars (2008), the game still has less than eight years to its name, which is not enough time to spot a legitimate strategic evolution. 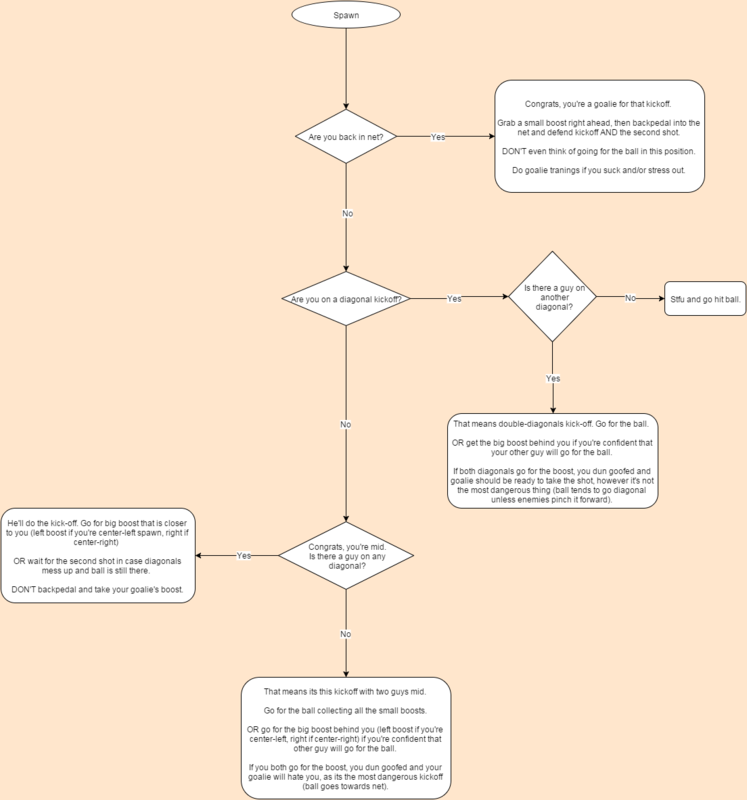 However, what should become clear after a few weeks playing the game in the standard 3-on-3 mode is that the strategies in Rocket League progress as the player’s skill progresses. There are several tactics that players of all levels share, and we can spot an evolution of these through individual player progression, and this evolution is a mirror of soccer’s changes throughout history. If you can’t play the game, watching YouTubers such as Blitzwinger, Markiplier, and Pyropuncher play their first matches is a good way to watch a digital approximation of Calcio Fiorentino. They only focus on hitting the ball without any defined positioning or organization, all while looking for the goal or boosting towards their own net to defend it. It is common to see players ruining the plays of their own teammates because of their instinct to chase after and hit the ball no matter what. As with the Cambridge Rules stated for soccer in 1848, in my first matches of Rocket League there were no players between the adversary’s goal and the ball. Due to the low number of players on the pitch, there was a need to constantly rotate between attack and offense. After some matches, players start to learn from their mistakes—like watching a ball slowly roll unstoppably towards their goal because all players were too focused on attacking. It’s usually at this time that they start to experiment with different tactics, both useful and weird. Two attackers and a static goalkeeper; or one attacker, one midfielder, and one goalkeeper; or even a goalkeeper, a defender, and a single attacker. Players choose where and how they want to play and adjust their strategies during the match according to how their teammates play. This is necessary due to the in-game communication usually being limited due to the game system. The in-game communication can either be text or voice-based, but the voice chat is not team-exclusive and the game’s pace is too intense to stop and type in the chat in the team-exclusive “tab.” The quick chat system, which can automatically reproduce some sentences at the touch of a d-pad, is also limited to simple commands such as “Take the Shot!” and “Centering…”, and players are not able to customize them. Most of the time, only the goalkeeper can voice her intentions through the “Defending…” command. At the intermediate levels, it is common to see a much stronger midfield and defense allied with constant rotations to the attack zone, similar to the WM attack-midfield-defense coordination. The game is almost always happening in the middle of the pitch during matches between high-level players, in a similar fashion to the current soccer strategies. Rocket League players appear to recreate the history of soccer as they improve their skills. But if you watch championship matches or Rocket League professionals like M1k3Rules, Kronovi, and Markydooda playing, you can see that Rocket League players are not merely mirroring soccer but are making a distinction between the two—pushing the car game further and making its strategies unique. Due to the size of the pitch, the cars’ mobility, and the number of players in a 3v3 match, the strategies have started to tend towards offensive and defensive rotations instead of fixed positioning. Hence, the names of the positions themselves mean completely different playstyles when we compare a club football and a Rocket League match. While in club football a defender stays far behind the midfield even when her team is attacking, in the battle-cars game the defender must play on the sides of the pitch, including extremely offensive positions, in order to make passes to the main attacker. The goalkeeper, who stays under the goalposts during a soccer match, is constantly moving to the midfield in Rocket League to make sure the ball will stay in the offensive zone. Rotations have become so important that MegaChip97 posted a rotation scheme on the game’s official Reddit forums. It becomes clearer that, as in Calcio, all players are attackers and defenders not because they want to score, but because it is the best system taking into account the game’s variables. The kickoff in Rocket League also has its own strategy. Every time a goal is scored, players spawn randomly between predefined positions on the pitch and have to tackle the ball in the middle to restart the game, which is very similar to what a horizontal basketball tipoff would be. 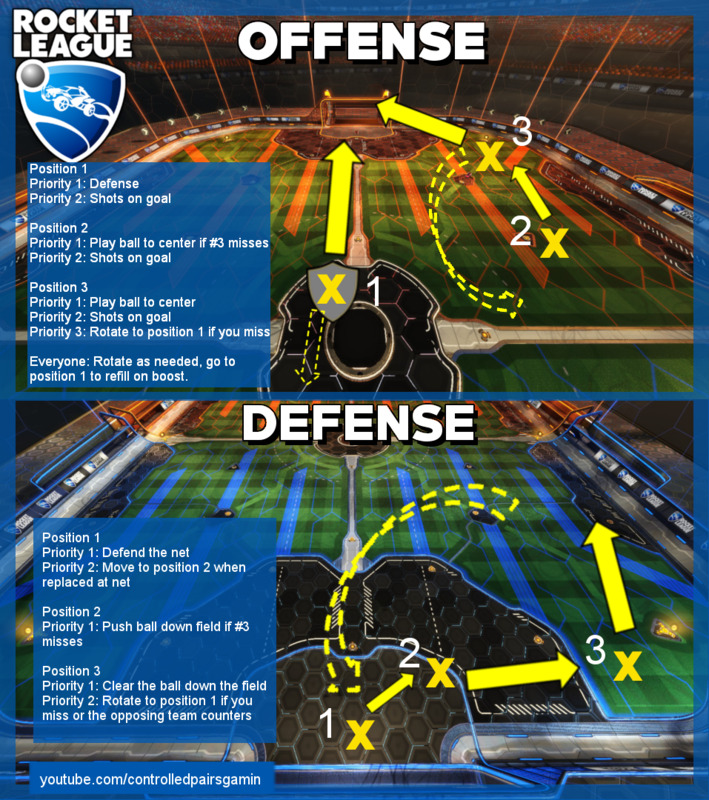 Based on these positions, a player named pingeee posted on Reddit a kickoff flowchart that guides players on how they should position themselves and act in the first seconds after the kickoff depending on where they are. On the other hand, the ball possession in the kickoff, in club football, is always of the team who received the goal, nullifying any kickoff strategies for the opposing team. The Major League Gaming Rocket League 2015 Final between Swarm Gaming and Flipsid3 Tactics perfectly illustrates all these points. The midfield is still important, the goalkeeper is practically extinct, a defender can become an attacker in a split second, and a defenseman often plays the role of a winger and play maker. The game has reached a stage in which the high-level players are adopting certain positions in the attack zone so that they can make and receive passes and set-up plays to their teammates, which almost never happens in intermediate and lower levels. What this proves is that Rocket League‘s strategies may have started copying soccer’s positioning, tactics, and even movement across the pitch, but these years of evolution in Super Acrobatic Rocker-Powered Battle-Cars and months in the modern game have made it possible for players to truly understand how these strategies must be adapted and shifted to fit the game’s purpose. At this point, it is safe to say that Rocket League is not “soccer with cars,” as it is often touted, but an evolving sport in its own right.